It just goes to show you never know what players will do! Here’s what happened. The players chose as characters: Edward, Hans, Conrad, Dimitri, and Imelda. I ran each character through scene one in the hotel room. Everyone but Conrad got dressed and headed downstairs to the Restaurant. No one did so without suspicion. Conrad went to the 5th floor (on the fly I decided the top floor was floor 5) and checked the emergency exits. He went downstairs after that. Scene two is where the fun started. The characters all sat down and waited for breakfast. The Cell Coordinator, Lusya, came in as described and sat down. Before anything much could be said, Imelda took matters into her own hands and, using a knife off of the table, got behind Lusya and held her “hostage”, knife to the throat, demanding what was going on. Edward smashed the waiter with his chair. Hans made no move whatsoever, not trusting anyone, and not wanting to end his tenure in the “Bureau” in less than a day. Conrad, on the other hand, headed for the kitchen. The maitre d’ tried to stop him, but was pushed aside. Dimitri did not commit to aggression. The struggle between Lusya and Imelda was part psychological and part physical. Five men with pistols entered the restaurant on the second turn. Lusya was unable to loose herself from Imelda’s grip and, at Imelda’s insistence, motioned the guards to lower their weapons. Dimitri urged caution and patience, surmising that his only real source of useful information was Lusya. Dimitri had yet to discover his own name! Lusya was able to explain that the characters now work for the Bureau, they did so of their own volition, and that memory loss is part of the “program” along with their new skills. Lusya explains that the characters first mission starts at an apartment on the outskirts of Tashkent. They were all driven to the metro where they would catch a train to their destination. What about Conrad? He discovered the cook was armed with a pistol. He pushed his way through some kitchen clutter and disarmed the cook. In the process, the cook escapes out an exit door. Conrad follows him through the streets of Tashkent, picking up some more appropriate clothing along the way. Conrad starts to realize he has skills not only with a gun, but for tailing as well as slight of hand. He begins to realize, like it or not, he is a trained agent. Even if he still doesn’t know his own name. Conrad follows the “cook” (do you still think he is just a cook?) to a tobacco shop (the player running Imelda thought that one up). He spies the cook in side and enters. The man behind the counter has his hand on “something”, but does not reveal it at the cook’s nod. Conrad asks for a cigarette and a light. He discovers that he is most definitely not a smoker. Following the cook to the back he has a more pleasant discussion and learns his name and the nature of what he is “in for”. The cook takes him in a yugo (everyone is underpaid, it’s not just us!) to the metro station where he meets up with the rest of the team. wrap up: Scene 1 and 2 could have easily taken 15 minutes. I like what the players did. They role-played not knowing who they were and not trusting anyone. There would be nothing wrong with just going along with what was being presented. Either way is fine. I wanted the players to enjoy being agents in that situation and doing what they felt was “right” for them. It is all about the fun. The cook? after he left the kitchen, totally made up on the fly. Fun times. Deniable Asset Response Has Been Outstanding! The response for “Deniable Asset: Hiding in the Mosque” has been great! For those of you who have downloaded, please post your play sessions on either http://www.story-games.com, http://www.RPG.net or The Forge (www.indie-rpgs.com/forge). Work is underway on the full product, “Deniable Asset.” It should be similar in size to our first release, “Of Gods and Relics Vendai”, that is, 8.25″ x 8.25″ and a bit shy of 200 pages. When? As soon as we can. When I have a closer idea of a time frame I’ll post that. I’d like to thank Megan Roberts and RPG Resource (http://www.rpg-resource.org.uk/) for their timely review of Hiding in the Mosque. I am hoping to get some feedback and play sessions either on the sites above or our own official forums (http://www.randomencounters.net/Forum_Page.html). If you post about “Deniable Asset: Hiding in the Mosque”, please feel free to comment on my blog or the official forums and let me know where! 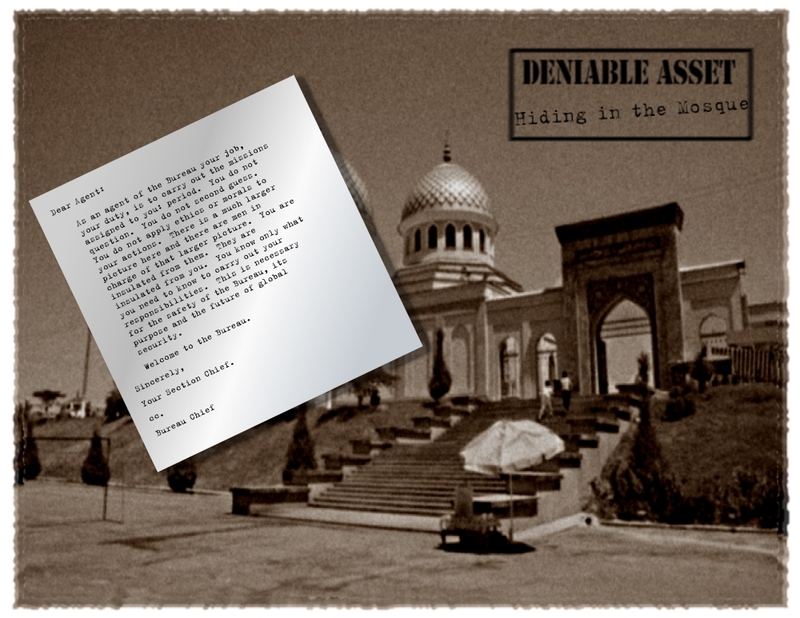 Free to download, “Deniable Asset: Hiding in the Mosque” is up on our download store! The core concepts of the Power of 12 and Deniable Asset condensed into 15 pages for your fun and review. A work in progress, I am hoping to get some feedback and hear what your RPG group does with it. I’ll be updating it as feedback comes in. Eventually, I’ll release Deniable Asset in full. There are feedback threads on RPG.net, Story-Games.com, and the Forge (www.indie-rpgs.com/forge). Feel free to post your feedback and where your group took the mission. Enjoy! I have had an espionage version of the Power of 12 in the works for some time. In fact it was through work on espionage that led to the system breakthrough that moved Power of 12 into the true role-playing experience that I was looking for. I am still on schedule for the free to download Of Gods and Relics adventure. I just had to get this espionage thing underway! Look for it in a week or so.